KVF Quad Corporation is a top supplier in mechanical metal finishing and powder coat painting in the Midwest Region. Serving Illinois, Iowa, Missouri and Wisconsin. KVF has the capability to process small parts to large assemblies, never turning away from any challenge. It’s a wonderful experience working with the entire KVF team! They go above and beyond with their customer service and their turnaround/lead times! The business relationship that has been built with KVF is appreciated. Keep up the great work! KVF Quad has been a strategic partner for us in pursuing new business. We work together as a team to launch to new projects. 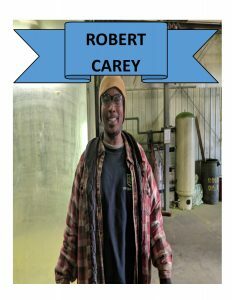 I would refer them to anyone who needs powder coating or shot blasting done. We send many parts of all shape and sizes to them and get great results. Their quality, lead time, customer service and pricing is great. From when they receive our parts to when they send them back the service is great. KVF Quad Corporation is the Quad Cities expert on powder coat painting. KVF Quad Corporation has tailored its powder coating paint application facilities to adapt to a wide range of size, shape, quantity and special components. KVF Quad has the ability to coat parts weighing up to 2000 lbs and sizes ranging from the size of a pen tip to 20 ft x 5 ft x 6 ft.
Abrasive blasting, or air blasting, is a method of propelling media, using compressed air, to clean and remove scale, rust, markings, previous coatings or weld splatter from component surfaces. Shot blasting utilizes wheel blast machines, often known in the industry as tumble, table or belt blast equipment. This aggressive process can generate anchor surface, remove tight mill scale, previous coatings, foundry slag, and leave components with a uniform exterior surface finish. With a variety of equipment types and sizes, and hundreds of media types, KVF Quad has what it takes to yield results in the mass finishing field. Totaling 226 cubic feet of processing equipment’s, KVF Quad operates round bowls, and rectangular tub finishing machines that can deburr, radius, descale, burnish, clean and brighten almost any type of metal component. The term “ultrasonic” refers to high frequency electrical sound. In parts cleaning application, ultrasonic high frequency vibrations generate sound waves in a cleaning solution in the same manner a vibrating drumhead generates sound waves in the air. Parts cleaning is essential to many industrial processes as a prelude to surface finishing or to protect sensitive components. KVF Quad adheres to strict guidelines, eg. choosing correct processes, type of substrate and nature of contamination and when dealing with customer specific cleanliness measurements or specifications. Also available is the option to add rust preventatives after each cleaning operation. KVF Quad provides used equipment sales as well for new equipment sale through our partners. A list of our equipment manufacturing partners. 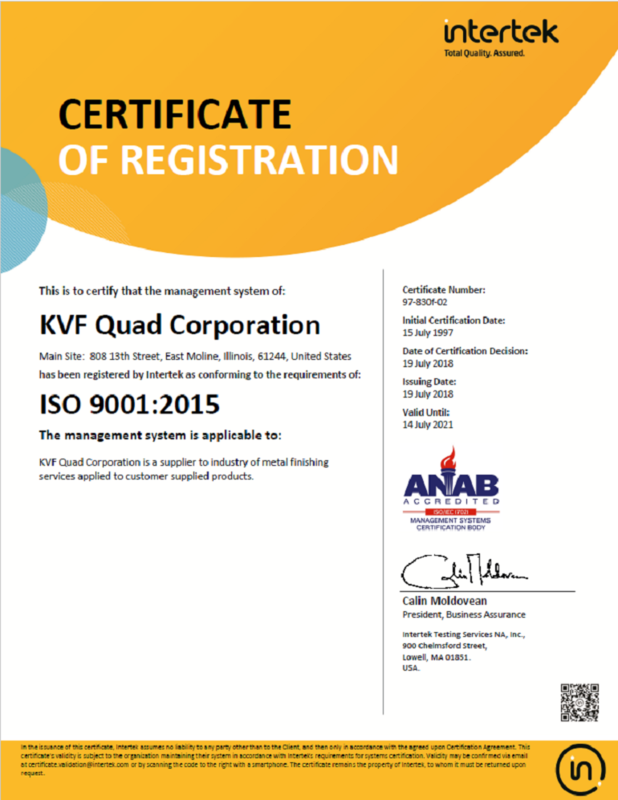 Since 1997, KVF Quad Corporation’s quality management system has been ISO Certified, and continues to maintain our qualifications to the most current revisions. KVF has a long history of providing quality products to customers such as Case-New Holland, Caterpillar, John Deere and a host of other companies who provide quality parts to the agricultural, aerospace, automotive, medical and construction industries. KVF’s quality policy and motto “To meet or exceed our customer’s expectations” reflects how actions bear testimony towards our total commitment. 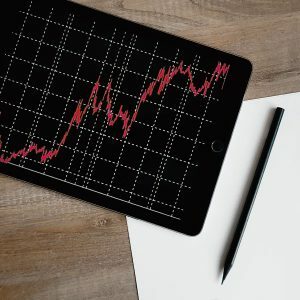 Listening to our customer, determining needs, defining product requirements and applying measures ensure our processes provide consistent uniform results and continuous customer satisfaction. Our ISO registrar, ITS Intertek Services, assesses our current certification for conformity annually. External, internal and ‘customer’ conducted second part audit results are available for review upon request. Making its home in East Moline, IL, KVF Quad Corporation has been open for business for 40+ years. 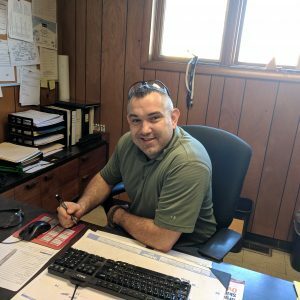 Originally starting in a small Rock Island, IL, shop, President and Owner Mike Crotty has built the company into a fully staffed professional job shop serving a customer base of 600+. Always progressive, KVF has opened its doors to many new and innovative processes and operations. 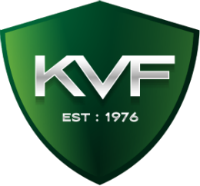 From its beginning, vibratory mass finishing has been the core of KVF’s business. Other processes such as: powder coat painting, ultra-sonic cleaning, thermal paint removal, abrasive blast finishing and component salvage have also created a market niche for KVF within the agricultural, aerospace, automotive, government, medical and construction equipment industries.